scarlet fever - WELCOME TO ERS 4 KIDS !! An exotoxin-mediated disease caused by Group A beta-hemolytic streptococcus. It usually results from a tonsillar/pharyngeal focus. Scarlet fever generally has a 1-4 days incubation period. The illness tends to be abrupt, usually heralded by sudden onset of fever associated with sore throat, headache, nausea, vomiting, abdominal pain, myalgias, and malaise. 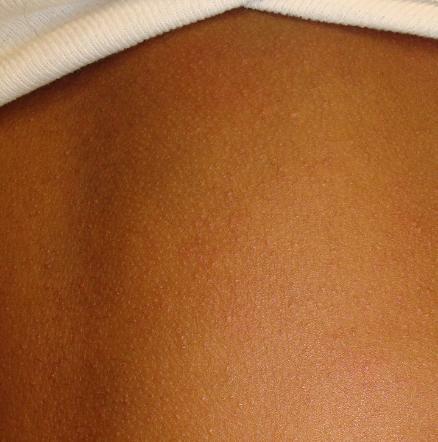 The characteristic rash appears 12-48 hours after onset of fever. It often starts as erythematous patches below the ears, chest and axilla. It then spreads to the trunk and the extremities. The skin lesions evolve and become more diffuse; they turn punctate and resemble a sunburn with goose pimples which become sandpaper-like. In the untreated patient, fever peaks by the second day (temperature as high as 103-104F) and gradually returns to normal in 5-7 days. Fever abates within 12-24 hours after initiation of antibiotic therapy. Exudative tonsillitis preceding scarlet fever often is accompanied by erythematous oral mucous membranes, along with petechiae and punctate red macules on the hard and soft palate and uvula (i.e., Forchheimer spots). On day 1 or 2, a white coating covers the dorsum of the tongue with reddened papillae projecting through, giving rise to the white strawberry tongue. By day 4 or 5, the white coating disappears, revealing the representative raspberry tongue. Another distinctive finding is circumoral pallor. Desquamation begins 7-10 days after. The goals when treating Scarlet fever are to prevent acute rheumatic fever, reduce the spread of infection, prevent suppurative complications and shorten the course of illness. Penicillin remains the drug of choice (documented cases of penicillin resistant group A strep have not yet been documented). Penicillin VK or penicillin G benzathine can be used. In cases of penicillin allergy, erythromycin may be used.